Rotating through America’s most beautiful cities, every year, the American Society of Landscape Architects (ASLA) holds the largest conference and exposition in the industry for students and professionals alike. This year, over 6,000 attendees comprised of landscape architects and industry innovators will flood to McCormick Place in Chicago, Illinois, for four days in November to not only inhale the breadth of architectural landscape wealth in such a world-class city, but also to learn from the best minds in the biz. The theme for the 2015 ASLA Expo is “Perspectives.” A theme of this caliber will highlight “the comprehensive viewpoint that helps enable landscape architects to effectively solve today’s complex planning and environmental design problems.” We couldn’t agree more. Kafka wholeheartedly supports ASLA’s mission to “advance landscape architecture through advocacy, communication, education and fellowship” since this is the group of people responsible for making our cities and communities the best they can be through well-crafted and well-designed built and natural environments. Kafka looks to attend the Annual ASLA Meeting and Expo every year to show avid and devoted support for ASLA and its mission by exhibiting and informing attendees what’s next for natural stone in landscape architecture. Every year, Kafka sponsors events through local ASLA chapters such as Wisconsin, Minnesota, and Illinois, but the National Annual Meeting & Expo is the main event! The American Society of Landscape Architects is always pushing the envelope for advancement in landscape architecture, and Kafka couldn’t be more thrilled to support America’s landscape architects. 1. 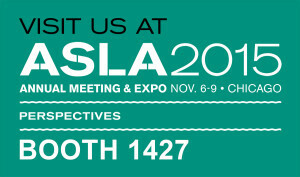 The ASLA offers the largest exposition in the industry. Imagine a room flooded with booths and demos of inventive and transformative products and services. The room serves as a veritable hive mind of innovators in landscape architecture. With over 400 exhibits, Landscape Architects can get hands-on with some of the newest innovations and information. Whether people are ogling over the newest environmentally friendly materials or learning about active living innovations, this expo has all the essentials to push today’s landscape architects into the future. Every year, the expo is the best-attended event of the Annual Meeting, and rightfully so—there isn’t an expo more full of industry know-how around. 2. Hard-earned recognition of great things. An important draw to the ASLA expo is the celebration and recognition of student and professional work. Twenty-three student projects were picked from over 300 entries submitted by architect students around the country and the world. In addition, 34 professional award recipients have been selected from an overwhelming 459 entries. Awards are put in the hands of those who designed the best public, commercial, residential, institutional, planning, communications and research projects. Whether appreciating the work that perfects basic factors, or recognizing the work that pushes the envelope, these awards make everyone in the industry want to do bigger and better things. 3. Education: The smartest minds in landscape architecture and all its facets come together at once. The educational sessions offered during the ASLA expo can be registered for LA CES™ (Landscape Architecture Continuing Education System) credit. These courses offer premium insight from landscape architecture professionals and masterminds. These courses are meant to enhance and expand the knowledge of all who take them. The end goal of these sessions is for design professionals to be able to take the learned skills and apply them to a variety of practice settings while using a wide range of competencies and proficiencies. While we are there as an exhibitor, we appreciate and support the knowledge opportunities available during this conference. Course materials and delivery are carefully crafted to ensure everyone who attends the classes walks away with newfound insight or know-how. Where else can you get so much industry knowledge and access in one space? Only at the ASLA Annual Meeting and Expo. More than 130 educational sessions take place and up to 21 professional development hours (PDH) can be earned during the ASLA Annual Meeting—which helps all professionals maintain things like licensures or LEED continuing education hours. Extra experience and knowledge goes a long way and can always be directly translated to helping our customers, partners and communities. 4. Ultra-fun special events throughout the city encourage good chats, good networking and good times had by all. The ASLA expo offers a series of special events to go to during this four-day convention. Most of them include delicious food and fine conversation while attendees mingle and discuss the trends of landscape architecture. Some of these events entail exploring Chicago’s rich and varied palette of landscaping architecture, such as the McCormick Bird Sanctuary and landscapes surrounding homes by the likes of Frank Lloyd Wright. Other events go to benefitting the youth and future of the industry. Kafka Granite is big fan of Chicago due to the beautiful landscape architecture that is embedded in the city. From Buckingham Fountain Plaza to Maggie Daley Park, Kafka Granite has many products throughout the Windy City, so keep your eyes peeled during your visit! 5. Kafka soaks up and spreads trends. The weekend’s jammed-pack schedule of sessions, exhibits and events not only educate attendees, but they also provide for a better tomorrow in terms of dispersing ideas and trends in design, sustainability, active living and materials. This is the perfect opportunity for us at Kafka to spread the benefits and possibilities that come with using speciality crushed stone in any of its varieties. We can spread the word about our state-of-the-art facilities and sustainable efforts, and we can promote the use of a naturally occurring material in landscape architecture. Not only can Kafka promote the trend of natural stone, but we can also soak in other trends relating to design, color, etc. Knowing what’s in demand or what the upcoming trends are through face-to-face interactions with professionals and students is huge for Kafka. By feeding the need for landscape environments such as trails or active living areas, every city and community could see a spike in the number of bike lanes, sidewalks, community gardens, walking trails, green roofs, parks, and more. ASLA itineraries are littered with sessions about giving healthier environments to communities through clever landscape architecture—another mega trend. They also delve into the world of newer technologies, methods and sustainable initiatives. Everyone wins. The action is happening this week, November 6–9 at North America’s Largest Convention Center: McCormick Place, 2301 S. Lake Shore Drive, Chicago. Kafka Granite will be exhibiting on Saturday and Sunday, November 7–8, from 9:00 A.M. to 6:00 P.M. Come visit us at Booth 1427, where we will be waiting and willing to discuss your designs and all that our speciality crushed stone products can offer. See you at the 2015 ASLA Annual Meeting and Expo! To register to attend the 2015 ASLA Meeting & Expo, visit aslameeting2015.com. If you can’t make it, join us in New Orleans in 2016, or check out our other upcoming events.